I was worried about you…it’s been so long since you did a post or a video. How is you mom feeling? I have to say, when the kids were young, we didn’t go out to eat much either…pizza maybe. It was too expensive for us to go out with the three kids…I don’t think they had the soup and salad thing back then. Glad you’re back…hope all is well! You are awesome, and I look up to you for being able to take 4 kiddos out to dinner. I am not brave enough to do it here in America yet. We did it in Thailand, but kids in Thailand could run around in the restaurant, and because they were blond and blue eyed, they were adored!!! In America I would have a hard time taking them out because I would fear what other people would think! I loved the restaurants that advertised one free child’s meal for each adult meal purchased. It will be interested to hear if others have had ‘sharing charges’ added to their tab. Awe, thanks so much Terra. Yeah, my kids get pretty shy in public, so it works out good. And because we don’t go out to eat very much, they seem to be more well behaved. But I wonder if that will change – especially with Jaden – who is naturally very rambunctious. Hi Janel! Yeah, it has been a crazy few months. I have hardly had time to do anything. My blog fell to the way side for a while. I missed it so much. I love writing. My mom is doing MUCH better. Thanks so much for asking. She comes home today (back to her home in NJ). She is eager to get back to reality after a long recovery. And yes, I agree about the cost going up when the kids get older. I have 3 boys and a girl and I know they will want to eat me out of house and home eventually. LOL Hopefully we will be better situated financially at that time. But thanks so much for taking the time to comment Janel. I hope you have a wonderful rest of the week! And don’t overlook the cost savings of getting your kids in the habit of drinking water when eating out. These are great tips! Restaurants do serve extra large portions. Me and my hubby would share a plate to save money when we just got married, then some restaurants started charging a fee for splitting a meal! I am happy to see you blogging again! Love the idea of drinking water! Thanks so much Teresha for taking the time to comment. 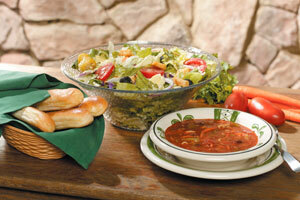 I sure hope that Olive Garden doesn’t start charging us for “splitting”. But at least it is a good thing for us now and we are able to go out to eat as a family here and there. Hope you have a great day!